The Democrat’s “War on Women” is a war no more. That is a good thing. If you or anyone you know still had the slightest inclination to think that the Democrat’s silly little strategy of demonizing conservative women to appease abortion activists was a good idea, it all dissipated with every vote cast tonight. The face of the “War on Women,” the Democrat’s darling, Wendy Davis, was beaten so badly it was embarrassing. Davis made abortion the central theme of her political life. Safe to say, it did not work. Greg Abbott (R-Texas) has won almost 60 percent of the votes as I write according to the Associated Press. But Wendy Davis was not the only one. The former senior Senator from Colorado Mark Udall (D-Colorado) made the so-called war on women and abortion the central theme of his campaign. So much so, it earned him the nickname “Mark Uterus,” which is about as embarrassing as his loss to Cory Gardner (R- Colorado) who won almost every county across the state. Sen. Kay Hagan (D) in North Carolina also made the “war on women” a centerpiece of her defense against the Republican challenger Thom Tillis, accusing him of opposing birth control and abortion “rights.” Her radical positions on abortion seemed to reduced women’s issues to reproductive issues alone, something Penny Nance, CEO and President of Concerned Women for America (CWA), was quoted addressing in several media outlets. She said, “Women look at things more holistically. In North Carolina, we know that the issues of jobs and the economy are very important to all women.” Penny suggested that more focus on “the importance of a free market economy where jobs can expand,” would be the winning strategy. And she was right. Thom Tillis won with 49 percent of the vote. But the race that put the last nail in the coffin of the “war on women” idiocy was the monumental win by Joni Ernst (R) in the great state of Iowa. Ernst called it a “phony” war. She famously said in a FOX interview, “First, I am a woman, and second I have been to war and this is not a war. Anytime the Democrats use that word, they should be doing it to honor our servicemen and women.” Ernst won with 52 percent of the vote. Joni Ernst is a different kind of candidate. As with the members of CWA, the media and political class cannot use old clichés and categories to define her. They better blow up the old molds and boxes in which they insist on putting every person that is different from them, especially in the case of conservative women. 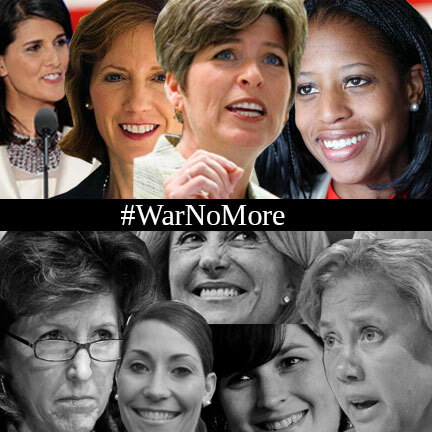 They will be hearing a lot more wisdom from these conservative women in the coming years.